Only 1000 pieces of this limited memorial edition will be created. Each piece will have an inscription (pictured above) to that effect in the lower right corner of the panel, and will measure 12" tall and 12" wide. A Certificate of Authenticity will also be enclosed as well as an acrylic stand specially made for this piece. The first two hundred of these replica's will be donated to the families of those killed in the Pentagon Attack on September 11th as well as other dignitaries. Only after the families have received their windows will we begin shipping to the general public. We are offering this replica to give everyone an opportunity to own this piece of history. We are offering these at a fixed price to make them available all who want them. With the donation of 200 to the victims families, there are only 800 available for purchase. You will be buying directly from the manufacturer and these are not available through any other source at any price. The Limited Edition Windows will be sold for $99.95 plus $9.00 for Shipping and Handling. 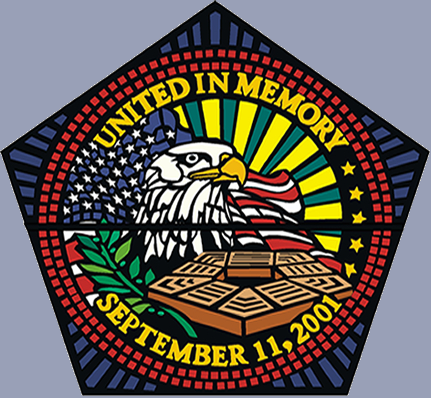 All Military and Family Members of 9/11 Victims may purchase the Limited Edition Window at the special rate of $85.00 plus $9.00 for Shipping and Handling. 12" tall and 12" wide Non-Limited Edition Replicas will be released in late September and will retail for $85.00 plus $9.00 for Shipping and Handling. 4" Non-Limited Edition Replicas will be released in late September and will retail for $28.50 plus $5.00 for Shipping and Handling. Please E-mail us or call 1-800-259-1842 for questions about the window or inquiries for wholesale pricing.